All you need to know about Café Hawelka is that I wasn’t two steps inside before the elderly owner had shaken my hand furiously and wished me a fine morning with a broad and entirely genuine smile. The Hawelka is as comforting as a pair of well-worn slippers (with the emphasis on well-worn). 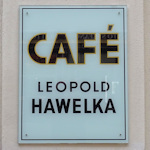 Café Hawelka reeks of authenticity. It seeps out of the worn upholstered seats on the corner sofas, the chipped wooden chairs cluttered around marble tables, and the threads of fraying velvet curtains. Authentic…and old, the insides barely changed in the 80 or so years since the legendary Leopold und Josefine Hawelka first began serving coffee there (it was their son who greeted me at the door). The hospitality shown by the Hawelkas eventually led to their cafe establishing a reputation as the post-war haunt of young artists, writers and intellectuals. Arthur Miller visited. So did Warhol. And Ustinov. Echoes of this boiling pot of creativity remain on the walls. Posters advertising local art exhibitions cover one side of the cafe. Original artwork dots other walls, some accepted in payment for debts run up by impecunious artists. The menu is a mounted blackboard, items and prices written in faded chalk. A tuxedoed waiter slips between the tables with ease, bringing coffee in porcelain cups bearing Leopold’s signature. The occasional apple strudel makes an appearance, a pair of frankfurter sausages with a roll and mustard. Perhaps a slice of house cake or the famous Buchteln, a kind of sweet roll made to Josefine’s own recipe. But it’s mostly all about the coffee, or a glass of wine later in the day. You enter and time seems frozen. Outside is modern Vienna. Inside is Vienna as it once was. The Vienna of fierce discussion and youthful bravado, intellects blossoming improbably in the “living room” of the hardworking Hawelkas. I visited early on a cold January weekday morning. There was plenty of space but my friends warned me that the Hawelka’s reputation and history means it fills fast during the tourist seasons. Go early…and wind your watches back a few decades when you do. You’ll find the coffee house on a quiet side street that also houses the Jewish Museum. The street leads from Vienna’s pedestrianised centre to the Albertina Museum, and Stephansplatz station (on the U1 and U3 subway lines) is but a short walk away. At the time of visiting (January 21, 2019), open daily from 8 am to midnight (Monday to Thursday), 8 am to 1 am (Friday and Saturday) and 10 am to midnight (Sunday).